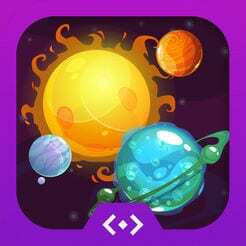 Description: Students will use a Merge Cube to hold the planets in their hands! Science TEK: 3.8BCD The student knows there are recognizable patterns in the natural world and among objects in the sky. The student is expected to: (B) describe and illustrate the Sun as a star composed of gases that provides light and thermal energy; (C) construct models that demonstrate the relationship of the Sun, Earth, and Moon, including orbits and positions; and (D) identify the planets in Earth’s solar system and their position in relation to the Sun. Technology TEK: 1.C use virtual environments to explore systems and issues. Students can use MERGE Cubes with either iPads or iPod/cardboard (MERGE Galactic Explorer app) to “hold the planets in their hands”. Using the iPad, they can view the solar system in their hand, move it around, and click on planets and the Sun to learn more. ISTE Standards: Empowered Learner- 1d Students understand the fundamental concepts of technology operations, demonstrate the ability to choose, use and troubleshoot current technologies and are able to transfer their knowledge to explore emerging technologies.